Nearly everyone has some fear that they are deficient in certain essential vitamins. This fear and uncertainty drives the nutritional supplement market—fear of vitamin deficiency and uncertainty about the efficacy of vitamin supplements choices. 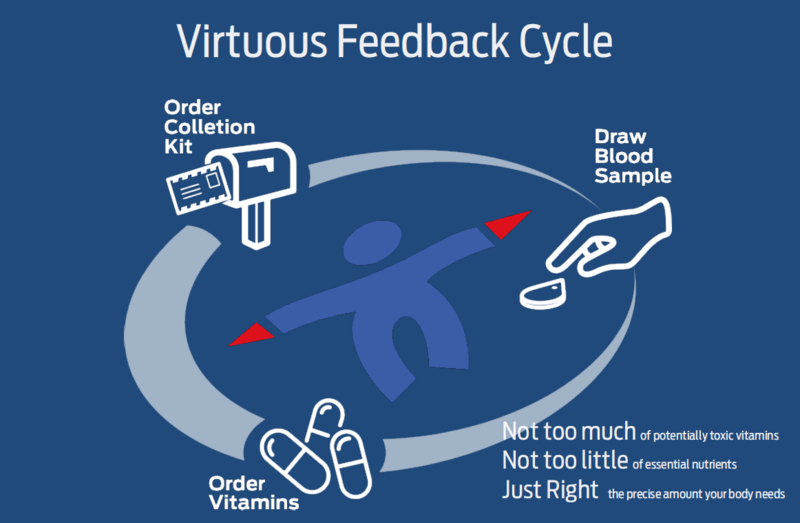 By introducing an easy-to-use, low-cost, in-home blood test, a feedback loop is created that allows you to know that your vitamin needs are being met. Bring evidence-based medical science to the multi-billion dollar vitamin supplement marketplace. Provide liver and kidney monitoring reduce risk of harm from vitamin overload. Enable users to perform convenient low-cost testing for frequent monitoring of their blood levels and adjustments to their customized supplement routine.